The BIOMEX experiment, performed by DLR, being attached by astronauts to the exterior of the International Space Station. Image credit: ESA. Each of NASA’s international astrobiology partners take a different tack in looking for the answer to the question of whether there is life elsewhere in the Universe. A creative, multi-pronged investigation is necessary with such a complicated problem – the answer will draw on a collaborative approach among biologists, geologists, chemists and many others. In the case of the German Aerospace Center (DLR)’s Institute of Planetary Research, there are two areas on which they focus their attention. DLR specializes in developing technology for space missions, including photometric technology, radiometers, laser altimeters, thermal probes and spectrometers, and contributes to NASA projects including Cassini, InSight and Dawn, plus European Space Agency (ESA) missions such as CoRoT, Rosetta and ExoMars and the forthcoming JUICE (JUpiter ICy moons Explorer) spacecraft. In particular, cameras are a speciality. Those high-resolution, color images have revealed details about Mars’ geologic and climate history, including evidence of ancient water flows that have led to evidence-based discussions of human habitability and settlement on the red planet. In addition, DLR has performed astrobiological experiments, for example BIOMEX (BIOlogy and Mars Experiment) [above] on board the International Space Station, which tests the extent to which extremophiles can survive in particular space environments. Furthermore, Rauer is head of a consortium developing an instrument for the planet-finding PLATO mission that will detect and characterize Earth-like planets in the habitable zone of Sun-like stars. This ties in with their second focus, which is to understand the evolution of planets, both in ourSolar System and around other stars.By understanding the planetary processes that make life possible, the search for life elsewhere can be concentrated on the places where it’s most likely to have evolved. This aspect of DLR’s work began with the Helmholtz Alliance‘Planetary Evolution and Life’ project. The Helmholtz Alliance is a science-focused program of the German government designed to solve “the grand challenges of science, society and industry.” Helmholtz gives out five-year grants to scientists who work in German institutions and elsewhere to come together on collaborative projects that especially aim to involve young people and promote equal opportunity. DLR’s planetary research work was funded in 2008 by Helmholtz and continued through 2015, having received an extension on the work in order to use up all the funds. In the framework of the Helmholtz Alliance, DLR became an affiliated partner of the NASA Astrobiology Institute (NAI) in early 2013. The Helmholtz program was only meant to be a one-time ‘jump-start’ for a research area, which is exactly what was accomplished with the $5 million euro per annum fund that made Germany one of the leading nations in planetary research. The planetary evolution work at DLR is now a regular research program with a long-term funding perspective, says the Alliance’s former director, Professor Tilman Spohn. While funding isn’t quite as robust as it once was under Helmholtz, it still stands as an independent program at the DLR. During the six years that planetary evolution research was a Helmholtz program, “We did some exoplanetary research, but we had a strong focus on Mars,” says Spohn. “We made major contributions using the data from Mars Express to look into the various [potentially] habitable provinces on Mars to find where life could have originated and could still be present. The big question that the planetary research program is currently attempting to answer is the same as before: how can we figure out which of the many planets outside our Solar System might harbor life? Scientists need to set defined parameters in order to make smart guesses about where to look. So they look for what life might leave behind, or signs that might reveal indirect evidence for life. Life might exist now, but may not be obvious, so looking for coincident or non-obvious signs of life is important. Elsewhere in the Solar System, life is more likely to have existed in the past than in the present, so what might it have left behind? That’s why DLR is looking closely at “the link between interiors, surface and atmosphere,” of planets, says Rauer. Understanding how each of those planetary regions affects the others enables scientists to see what might be produced by normal geologic or chemical processes, for example – and what might be anomalous. Other related questions include how life might affect the evolution of an entire planet over time. “This is a novel look at planetary geophysics – how do tectonics and interior structures influence the development of lifeforms?” asks Rauer. Since Earth has developed in tandem with life, and life has been affected by the geophysics of the Earth, we know that both of these things have happened at least once, here. So, looking for those signs and asking those questions elsewhere makes sense. To that end, DLR works on modeling planet formation and tectonics, the inner structures of planets, how magnetic fields originate, and how meteor impacts affect all of the above. They also engage, along with their partners, in laboratory investigations of extremophiles in conditions similar to Mars or space, and how water behaves in different environments. And, of course, they are figuring out how to detect organisms on the surface of a planet. Strategies and Realizations of Missions for Exploration of planetary habitability. Under the Helmholtz Alliance, the Planetary Evolution program worked with – and plans to continue working with, as part of DLR – international partners across Europe and beyond, including ESA, NASA Ames, NASA’s Jet Propulsion Laboratory, the Johns Hopkins University Applied Physics Laboratory, the Japan Aerospace Exploration Agency (JAXA), the French Centre national de la recherche scientifique (CNRS) and Centre national d’études spatiales (CNES), and many other institutions and universities around the world. Forty years ago, the Voyager 2 spacecraft launched from Florida’s Cape Canaveral. Over the next decade, it swept across the solar system, sending back images of Jupiter’s volcanoes, Saturn’s rings, and for the first time, the icy atmospheres of Uranus and Neptune. The mission was more than enough to encourage Stephen Kane, a teenager growing up in Australia, to study planetary science in college. By the time he’d graduated, scientists had detected the first planet outside our solar system, known as an exoplanet, inspiring him to join the hunt and look for more. Over the past two decades, Kane, now an associate professor of planetary astrophysics at UC Riverside, has discovered hundreds of alien planets. At first, he focused on identifying giant Jupiter-like planets, which he describes as “low-hanging fruit” due to their large sizes. But in 2011, the Kepler Space Telescope identified the first rocky planet — Kepler 10b. Unlike gas giants such as Jupiter, rocky planets could potentially harbor life. With the discovery of more Earth-sized planets on the horizon, Kane realized that astrophysicists would struggle to understand the data they were receiving about terrestrial planets and their atmospheres. “During the course of the ongoing Kepler mission, I sought out planetary and Earth scientists because they’ve spent hundreds of years studying the solar system and how the Earth’s atmosphere has been shaped by biological and geophysical processes, so they have a lot to bring to the table,” Kane said. In 2017, Kane formalized that collaboration by joining an interdisciplinary research group led by Tim Lyons, a distinguished professor of biogeochemistry in the Department of Earth Sciences and director of UCR’s Alternative Earths Astrobiology Center. Backed by roughly $7.5 million from NASA, the center, one of only a handful like it in the world, brings together geochemists, biologists, planetary scientists, and astrophysicists from UCR and partner institutions to search for life on distant worlds using a template defined by the only known planet with life: Earth. Since its formation more than 4.5 billion years ago, Earth has undergone immense periods of geological and biological change. When the first life appeared — in the form of simple microbes — the sun was fainter, there were no continents, and there was no oxygen in the atmosphere. A new kind of life emerged around 2.7 billion years ago: photosynthetic bacteria that use the sun’s energy to convert carbon dioxide and water into food and oxygen gas. Multicellular life evolved from those bacteria, followed by more familiar lifeforms: fish about 530 million years ago, land plants 470 million years ago, and mammals 200 million years ago. While it might seem impossible to characterize ancient oceans and atmospheres, scientists can glean hints by studying rocks formed billions of years ago. The search for alien biosignatures typically centers on the gases produced by living creatures on Earth because they’re the only examples scientists have to work with. But Earth’s many chapters of inhabitation reveal the great number of possible gas combinations. Oxygen gas, ozone, and methane in a planet’s biosignature could all indicate the presence of life — and seeing them together could present an even stronger argument. The center’s search for life is different from the hunt for intelligent life. While those researchers probe for signs of alien civilizations, such as radio waves or powerful lasers, Lyons’ team is essentially looking for the byproducts of simple lifeforms. The UCR team must also account for processes that produce the same gases without contributions from life, a phenomenon researchers call false positives. For example, a planetary atmosphere with abundant oxygen would be a promising biosignature, but that evidence could be misleading without fully addressing where it came from. Similarly, methane is a key biosignature, but there are many nonbiological ways to produce this gas on Earth. These distinctions require careful considerations of many factors, including seasonal patterns, tectonic activity, the type of planet and its star, among other data. False negatives are another concern, Lyons said. In previous research on ancient organic-rich rocks collected in Western Australia and South Africa, his group showed that about two billion years passed between the moment organisms first started producing oxygen on Earth and when it accumulated at levels high enough to be detectable in the atmosphere. In that scenario, a classic biosignature, oxygen, could be missed. With several hundred terrestrial planets confirmed and many more awaiting discovery, the search for life-bearing worlds is an almost overwhelming task. Astronomers are narrowing down their search by focusing on habitable zones — the orbital region around stars where it’s neither too hot nor too cold for liquid water to exist on the surface. “We know that liquid water is essential for life as we know it, and so we’re beginning our search by looking for planets that are capable of having similar environments to Earth. We call this approach ‘following the water,’” Kane said. While the habitable zone serves as a target selection tool, Kane said a planet nestled in this region won’t necessarily show signs of life — or even liquid water. Venus, for example, occupies the inner edge of the Sun’s habitable zone, but its scorching surface temperature has boiled away any liquid water that once existed. “We are extremely fortunate to have Venus in our solar system because it reminds us that a planet can be exactly the same size as Earth and still have things go catastrophically wrong,” Kane said. Equally important, being in the habitable zone doesn’t mean a planet will boast other factors that make Earth ideal for life. In addition to liquid water, the perfect candidate would have an insulating atmosphere and a protective magnetic field. It would also offer the right chemical ingredients for life and ways of recycling those elements over and over when continents collide, mountains lift up and wear down, and nutrients are swept back to the seas by rivers. “People question why we focus so intently on Earth, but the answer is obvious. We only know what we know about life because of what the Earth has given us,” said Lyons, who has spent decades reconstructing the conditions during which life evolved. Kane said a distant planetary system called TRAPPIST-1, which NASA scientists discovered in 2017, could provide clues about the ingredients that are necessary for life. Although miniature compared to our own solar system — TRAPPIST-1 would easily fit inside Mercury’s orbit around the sun — it boasts seven planets, three of which are in the habitable zone. However, the planets don’t have moons, and they may not even have atmospheres. “We are finding that compact planetary systems orbiting faint stars are much more common than larger systems, so it’s important that we study them and find out if they could have habitable environments,” Kane said. An artist’s illustration of the possible surface of TRAPPIST-1f, one of the planets in the TRAPPIST-1 system. At about 40 light-years (235 trillion miles) from Earth, the TRAPPIST-1 system is relatively close, but we’re never going to go there. While scientists have studied the atmospheres of several dozen exoplanets, most are too distant to probe with current instruments. That situation is changing. In April, NASA launched its Transiting Exoplanet Survey Satellite, known as TESS, which will seek Earth-sized planets around more than 500,000 nearby stars. In May 2020, NASA plans to launch the James Webb Space Telescope, which will perform atmospheric studies of the rocky worlds discovered by TESS. Like Kepler, TESS detects exoplanets using the transit method, which measures the minute dimming of a star as an orbiting planet passes between it and the Earth. Because light also passes through the atmosphere of planets, scientists will use the Webb telescope to identify the blanket of gases surrounding them through a technique called spectroscopy. Kane and Lyons are working with NASA to design missions that will directly image exoplanets in ways that will ensure that interdisciplinary teams such as theirs can properly interpret a wide variety of planetary processes. “As we design future missions, we must make sure they are equipped with the right instruments to detect biosignatures and geological processes, such as active volcanoes,” Kane said. UCR’s astrobiology team is one of only a few groups in the world studying ancient Earth to create a catalog of biosignatures that will inform mission design in NASA’s search for life on distant worlds. With quintillions — think the number of gallons of water in all of our oceans — of potentially habitable planets in the universe, Lyons said he is optimistic that we’ll find signs of life in the future. A NASA illustration of TESS monitoring stars outside our solar system. In April, the Transiting Exoplanet Survey Satellite (TESS) Mission launched with the goal of discovering new Earths and super-Earths around nearby stars. As a guest investigator on the TESS Mission, Stephen Kane will use University of California telescopes, including those at the Lick Observatory in Mt. Hamilton to help determine whether candidate exoplanets identified by TESS are actually planets. By studying the planet mass data obtained from the ground-based telescopes and planet diameter readings from spacecraft observations, Kane will also help determine the overall composition of the newly identified planets. Widely recognized as one of the most ethnically diverse research universities in the nation, UCR’s current enrollment is more than 21,000 students, with a goal of 25,000 students by 2020. The campus is in the midst of a tremendous growth spurt with new and remodeled facilities coming on-line on a regular basis. We are located approximately 50 miles east of downtown Los Angeles. UCR is also within easy driving distance of dozens of major cultural and recreational sites, as well as desert, mountain and coastal destinations. In their search for life in solar systems near and far, researchers have often accepted the presence of oxygen in a planet’s atmosphere as the surest sign that life may be present there. A new Johns Hopkins study, however, recommends a reconsideration of that rule of thumb. Simulating in the lab the atmospheres of planets beyond the solar system, researchers successfully created both organic compounds and oxygen, absent of life. The findings, published Dec. 11 by the journal ACS Earth and Space Chemistry, serve as a cautionary tale for researchers who suggest the presence of oxygen and organics on distant worlds is evidence of life there. Oxygen makes up 20 percent of Earth’s atmosphere and is considered one of the most robust biosignature gases in Earth’s atmosphere. In the search for life beyond Earth’s solar system, however, little is known about how different energy sources initiate chemical reactions and how those reactions can create biosignatures like oxygen. While other researchers have run photochemical models on computers to predict what exoplanet atmospheres might be able to create, no such simulations to his knowledge have before now been conducted in the lab. The research team performed the simulation experiments in a specially designed Planetary HAZE (PHAZER) chamber in the lab of Sarah Hörst, assistant professor of Earth and planetary sciences and the paper’s co-author. The researchers tested nine different gas mixtures, consistent with predictions for super-Earth and mini-Neptune type exoplanet atmospheres; such exoplanets are the most abundant type of planet in our Milky Way galaxy. Each mixture had a specific composition of gases such as carbon dioxide, water, ammonia, and methane, and each was heated at temperatures ranging from about 80 to 700 degrees Fahrenheit. He and the team allowed each gas mixture to flow into the PHAZER setup and then exposed the mixture to one of two types of energy, meant to mimic energy that triggers chemical reactions in planetary atmospheres: plasma from an alternating current glow discharge or light from an ultraviolet lamp. Plasma, an energy source stronger than UV light, can simulate electrical activities like lightning and/or energetic particles, and UV light is the main driver of chemical reactions in planetary atmospheres such as those on Earth, Saturn, and Pluto. After running the experiments continuously for three days, corresponding to the amount of time gas would be exposed to energy sources in space, the researchers measured and identified resulting gasses with a mass spectrometer, an instrument that sorts chemical substances by their mass to charge ratio. The research team found multiple scenarios that produced both oxygen and organic molecules that could build sugars and amino acids—raw materials for which life could begin—such as formaldehyde and hydrogen cyanide. We’ve been doing some thinking — quite a bit, actually — about all the things that go on at Johns Hopkins. Discovering the glue that holds the universe together, for example. Or unraveling the mysteries of Alzheimer’s disease. Or studying butterflies in flight to fine-tune the construction of aerial surveillance robots. Heady stuff, and a lot of it. In fact, Johns Hopkins does so much, in so many places, that it’s hard to wrap your brain around it all. It’s too big, too disparate, too far-flung. We created the Hub to be the news center for all this diverse, decentralized activity, a place where you can see what’s new, what’s important, what Johns Hopkins is up to that’s worth sharing. It’s where smart people (like you) can learn about all the smart stuff going on here. At the Hub, you might read about cutting-edge cancer research or deep-trench diving vehicles or bionic arms. About the psychology of hoarders or the delicate work of restoring ancient manuscripts or the mad motor-skills brilliance of a guy who can solve a Rubik’s Cube in under eight seconds. There’s no telling what you’ll find here because there’s no way of knowing what Johns Hopkins will do next. But when it happens, this is where you’ll find it. Move over Mars rovers, new technologies to detect alien life are on the horizon. A group of scientists from around the world, led by astrochemistry expert Chaitanya Giri from the Tokyo Institute of Technology in Japan, have put their heads together to plan the next 20 years’ worth of life-detection technologies. The study is currently awaiting peer review, but is freely available on the pre-print site, ArXiv. For decades, astrobiologists have scoured the skies and the sands of other planets for hints of extraterrestrial life. Not only are these researchers trying to find ET, but they’re also aiming to learn about the origin and evolution of life on Earth, the chemical composition of organic extraterrestrial objects, what makes a planet or satellite habitable, and more. But the answers to such questions are preceded by long years of planning, development, problem-solving and strategising. Late in 2017, 20 scientists from Japan, India, France, Germany and the USA – each with a special area of expertise – came together at a workshop run by the Earth-Life Science Institute (ELSI) at Giri’s Tokyo campus. There, they discussed the current progress and enticing possibilities of life-detection technologies. In particular, the boffins debated which ones should be a priority for research and development for missions within the local solar system – in other words, which instruments will be most feasible to out onto a space probe and send off to Mars or Enceladus during the next couple of decades. Of course, the planets and moons in the solar system are an extremely limited sample of the number of potentially habitable worlds in the universe, but understanding our own backyard will be key in interpreting data from far-flung exoplanets. So, according to these astrobiology experts, what’s the future plan for alien detection? The first step of any space mission is to study the planet or satellite from afar to determine whether it is habitable. Luckily, an array of next-generation telescopes is currently being built, from the ultra-sensitive James Webb Space Telescope, slated for launch in 2021, to the gargantuan Extremely Large Telescope in Chile, which will turn its 39-metre eye to the sky in 2024. The authors point out that observatories such as these will vastly expand our theoretical knowledge of planet habitability. Just because a world is deemed habitable doesn’t mean life will be found all over it, though. It may exist only in limited geographical niches. To reach these inaccessible sites, the paper argues that we will require “agile robotic probes that are robust, able to seamlessly communicate with orbiters and deep space communications networks, be operationally semi-autonomous, have high-performance energy supplies, and are sterilisable to avoid forward contamination”. But according to Elizabeth Tasker, associate professor at the Japan Aerospace Exploration Agency (JAXA), who was not involved in the study, getting there is only half the struggle. “In fact, it’s the most tractable half because we can picture the problems we will face,” she says. The second, more pressing issue is how to recognise life unlike anything we know on Earth. According to the paper, the way forward is to equip missions with a suite of life-detection instruments that don’t look for life as we know it, but are instead able to identify the kinds of features that make organisms function.
] (to find DNA, RNA, peptides, and other small molecules), and fluorescence microscopy [ https://www.hou.usra.edu/meetings/lpsc2014/pdf/2744.pdf ](to identify the presence of cell membranes). They also nominate different forms of gas chromatography (to spot amino acids and sugars formed by living organisms, plus checking to see if molecules are “homochiral” [Space Science Reviews] (a suspected biosignature) using microfluidic devices and microscopes. High-resolution, miniaturised mass spectrometers would also be helpful, characterising biopolymers, which are created by living organisms, and measuring the elemental composition of objects to aid isotopic dating. Giri and colleagues also stress that exciting developments in machine learning, artificial intelligence, and pattern recognition will be useful in determining whether chemical samples are biological in origin. Interestingly, researchers are also developing technologies that may allow the detection of life in more unconventional places. On Earth, for example, cryotubes were recently used [International Journal of Systematic and Evolutionary Microbiology] to discover several new species of bacteria in the upper atmosphere. The scientists also discuss how certain technologies – such as high-powered synchrotron radiation and magnetic field facilities – are not yet compact enough to fly to other planets, and so samples must continue to be brought back for analysis. Several sample-and-return missions are currently underway, including JAXA’s Martian Moons exploration mission to Phobos, Hayabusa-2 to asteroid Ryugu, and NASA’s OSIRIS-rex to asteroid Bennu. What we learn from handling the organic-rich extraterrestrial materials brought back from these trips will be invaluable. What we learn from handling the organic-rich extraterrestrial materials brought back from these trips will be invaluable. The predictions and recommendations put forward by Giri and colleagues are the first steps in getting these technologies discussed in panel reviews, included in decadal surveys, and eventually funded. They complement several similar efforts, including a report prepared by US National Academies of Science, Engineering and Medicine (NASEM), calling for an expansion of the range of possible ET indicators, and a US-led exploration of how the next generation of radio telescopes will be utilised by SETI. Perhaps most importantly, these papers all highlight the need for collaborative work between scientists across disciplines. “A successful detection of life will need astrophysicists and geologists to examine possible environments on other planets, engineers and physicists to design the missions and instruments that can collect data, and chemists and biologists to determine how to classify life,” JAXA’s Tasker says. It can, for one, be produced without biology, although on Earth biology is the major source. Conditions on other planets, however, might be different, producing lots of oxygen without life. And then there’s the troubling reality that for most of the time there has been life on Earth, there would not have been enough oxygen produced to register as a biosignature. So oxygen brings with it the danger of both a false positive and a false negative. Wading through the long list of potential other biosignatures is rather like walking along a very wet path and having your boots regularly pulled off as they get captured by the mud. Many possibilities can be put forward, but all seem to contain absolutely confounding problems. With this reality in mind, a group of several dozen very interdisciplinary scientists came together more than a year ago in an effort to catalogue the many possible biosignatures that have been put forward and then to describe the pros and the cons of each. “We believe this kind of effort is essential and needs to be done now,” said Edward Schwieterman, an astronomy and astrobiology researcher at the University of California, Riverside. “Not because we have the technology now to identify these possible biosignatures light years away, but because space and ground telescopes of the future need to know what to look for and what kind of equipment they will need to make the potentially find it. The known and inferred population of exoplanets — even small rocky exoplanets — is now so vast that it’s tempting to assume that some support life and that some day we’ll find it. After all, those billions of planets are composed of same basic chemical elements as Earth and are subject to the same laws of physics. That assumption of life widespread in the galaxies may well turn out to be on target. But assuming this result, and proving or calculating a high probability of finding extraterrestrial life, are light years apart. The timing of this major community effort is hardly accidental. There is a National Academy of Sciences effort underway to review progress in the science of reading possible biosignatures from distant worlds, something that I wrote about recently. The two mission proposals, which are competing with several others, would provide the best opportunity by far to determine whether life exists on other distant planets. With these formal planning and prioritizing efforts as a backdrop, NASA’s Nexus for Exoplanet System Science (NExSS) called for a biosignatures workshop in the fall of 2016 and brought together scientists from many disciplines to wrestle with the subject. The effort led to the white paper submitted to NAS and will result in publication of as many as five much more detailed papers in the journal Astrobiology this spring. The overview paper with Schwieterman as first author, which has already been made available to the community for peer review, is expected to lead off the package. So what did they find? First off, that Earth has to be their guide. “Life on Earth, through its gaseous products and reflectance and scattering properties, has left its fingerprint on the spectrum of our planet,” the paper reads. “Aided by the universality of the laws of physics and chemistry, we turn to Earth’s biosphere, both in the present and through geologic time, for analog signatures that will aid in the search for life elsewhere. Vegetation is probably clearest example of how change-over-time can be a biosignature. As these maps show and we all know, different parts of the Earth have different seasonal colorations. Detecting exoplanetary change of this sort would be a potentially strong signal, though it could also have some non-biological explanations. If there is any kind of atmospheric chemical corroboration, then the time signal would be a strong one. That corroboration could come in seasonal modulations of biologically important gases such as CO2 or O2. Changes in cloud cover and the periodic presence of volcanic gases can also be useful markers over time. Plant pigments themselves which have been proposed as a surface biosignature. Observed in the near infrared portion of the electromagnetic spectrum, the pigment chlorophyll — the central player in the process of photosynthesis — shows a sharp dropoff in reflectance at a particular wavelength. This abrupt change is called the “red edge,” and is a measurement known to exist only which chlorophyll engaged in photosynthesis. So the “red edge,” or parallel dropoffs in reflectance of other pigments on other planets, is another possible biosignature in the mix. And then there is “glint,” reflections from exoplanets that come from light hitting water. True-color image from a model (left) compared to a view of Earth from the Earth and Moon Viewer (http://www.fourmilab.ch/cgi-bin/Earth/). A glint spot in the Indian Ocean can be clearly seen in the model image. Since biosignature science essentially requires the presence of H2O on a planet, the clear detection of an ocean is part of the process of assembling signatures of potential life. Just as detecting oxygen in the atmosphere is important, so too is detecting unmistakable surface water. But for reasons of both science and detectability, the chemical make-up exoplanet atmospheres is where much biosignature work is being done. The compounds of interest include (but are not limited to) ozone, methane, nitrous oxide, sulfur gases, methyl chloride and less specific atmospheric hazes. All are, or have been, associated with life on Earth, and potentially on other planets and moons as well. The Schwieterman et al review looks at all these compounds and reports on the findings of researchers who have studied them as possible biosignatures. As a sign of how broadly they cast their net, the citations alone of published biosignature papers number more than 300. All this work, Schwieterman said, will pay off significantly over time. The search for biosignatures in the atmospheres of distant exoplanets is extremely difficult and time-consuming work. The telescopes that can potentially take the measurements required are few and more will come only slowly. And for the current and next generation of observatories, staring at a single exoplanet long enough to get a measurement of the compounds in its atmosphere will be a time-consuming and expensive process — and thus a relatively infrequent one. As a way to potentially improve the chances of finding habitable conditions on those exoplanets that are observed, a new approach has been proposed by a group of NASA scientists. The novel technique takes advantage of the frequent stellar storms emanating from cool, young dwarf stars. These storms throw huge clouds of stellar material and radiation into space – traveling near the speed of light — and the high energy particles then interact with exoplanet atmospheres and produce chemical biosignatures that can be detected. 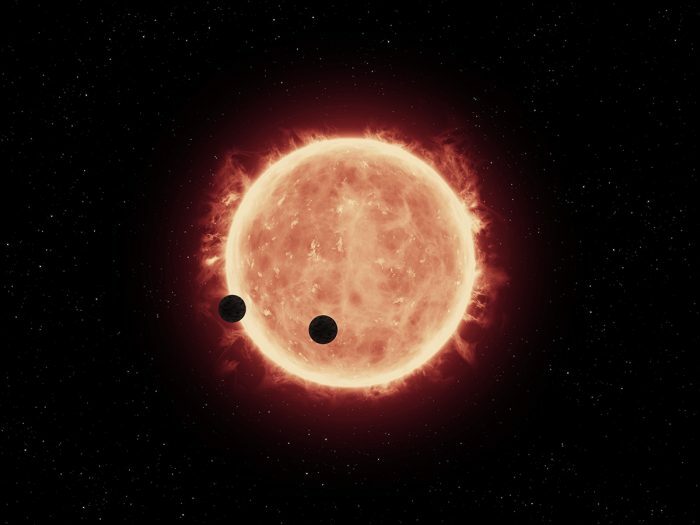 The study, titled “Atmospheric Beacons of Life from Exoplanets Around G and K Stars“, recently appeared in Nature Scientific Reports. 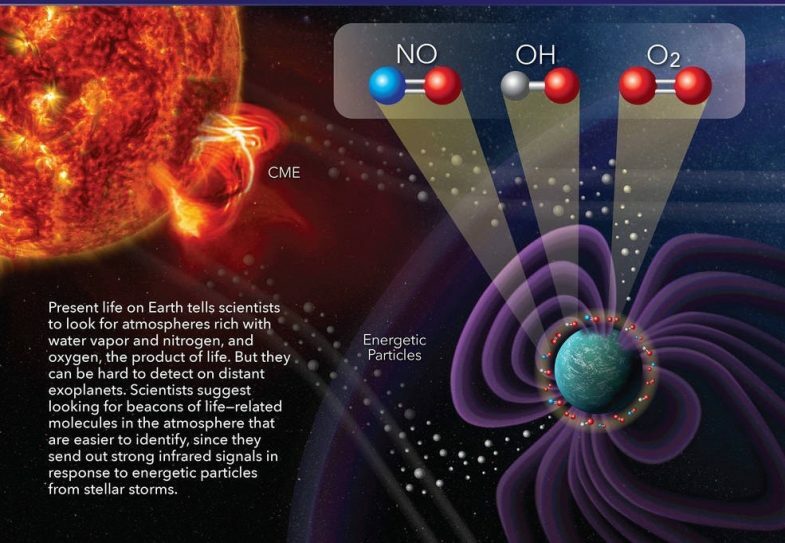 When high-energy particles from a stellar storm reach an exoplanet, they break the nitrogen, oxygen and water molecules that may be in the atmosphere into their individual components. Water molecules become hydroxyl — one atom each of oxygen and hydrogen, bound together. This sparks a cascade of chemical reactions that ultimately produce what the scientists call the atmospheric beacons of hydroxyl, more molecular oxygen, and nitric oxide. For researchers, these chemical reactions are very useful guides. When starlight strikes the atmosphere, spring-like bonds within the beacon molecules absorb the energy and vibrate, sending that energy back into space as heat, or infrared radiation. Scientists know which gases emit radiation at particular wavelengths of light. So by looking at all the radiation coming from the that planet’s atmosphere, it’s possible to get a sense of what chemicals are present and roughly in what amounts.. Forming a detectable amount of these beacons requires a large quantity of molecular oxygen and nitrogen. As a result, if detected these compounds would suggest the planet has an atmosphere filled with biologically friendly chemistry as well as Earth-like atmospheric pressure. The odds of the planet being a habitable world remain small, but those odds do grow. “These conditions are not life, but are fundamental prerequisites for life and are comparable to our Earth’s atmosphere,” Airapetian wrote in an email. Stellar storms and related coronal mass ejections are thought to burst into space when magnetic reconnections in various regions of the star. For stars like our sun, the storms become less frequent within a relatively short period, astronomically speaking. Smaller and less luminous red dwarf stars, which are the most common in the universe, continue to send out intense stellar flares for a much longer time. Vladimir Airapetian is a senior researcher at NASA Goddard and a member of NASA’s Nexus for Exoplanet System Science (NExSS) initiative. The effect of stellar weather on planets orbiting young stars, including our own four billion years ago, has been a focus of Airapetian’s work for some time. For instance, Airapetian and Goddard colleague William Danchi published a paper in the journal Nature last year proposing that solar flares warmed the early Earth to make it habitable. They concluded that the high-energy particles also provided the vast amounts of energy needed to combine evenly scattered simple molecules into the kind of complex molecules that could keep the planet warm and form some of the chemical building blocks of life. In other words, they argue, the solar flares were an essential part of the process that led to us. What Airapetian is proposing now is to look at the chemical results of stellar flares hitting exoplanet atmospheres to see if they might be an essential part of a life-producing process as well, or of a process that creates a potentially habitable planet. Airapetian said that he is again working with Danchi, a Goddard astrophysicist, and the team from heliophysics to propose a NASA mission that would use some of their solar and stellar flare findings. 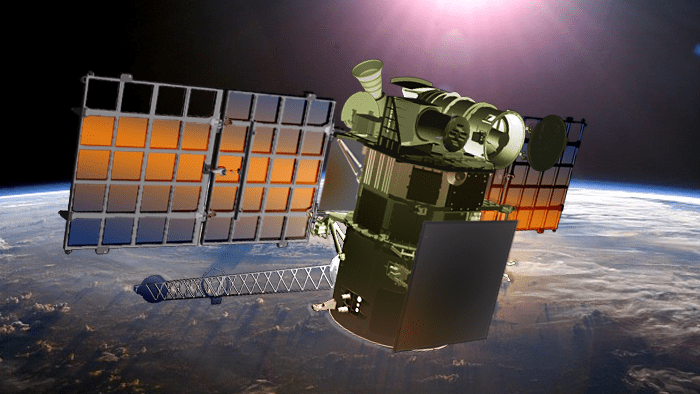 The mission being conceived, the Exo Life Beacon Space Telescope (ELBST), would measure infrared emissions of an exoplanet atmosphere using direct imaging observations, along with technology to block the infrared emissions of the host star. For this latest paper, Airapetian and colleagues used a computer simulation to study the interaction between the atmosphere and high-energy space weather around a cool, active star. They found that ozone drops to a minimum and that the decline reflects the production of atmospheric beacons. They then used a model to calculate just how much nitric oxide and hydroxyl would form and how much ozone would be destroyed in an Earth-like atmosphere around an active star. Earth scientists have used this model for decades to study how ozone — which forms naturally when sunlight strikes oxygenin the upper atmosphere — responds to solar storms. But the ozone reactions found a new application in this study; Earth is, after all, the best case study in the search for habitable planets and life. Will this new approach to searching for habitable planets out? Today, Earth enjoys a layer of protection from the high-energy particles of solar storms due to its strong magnetic field. However, some particularly strong solar events can still interact with the magnetosphere and potentially wreak havoc on certain technology on Earth. 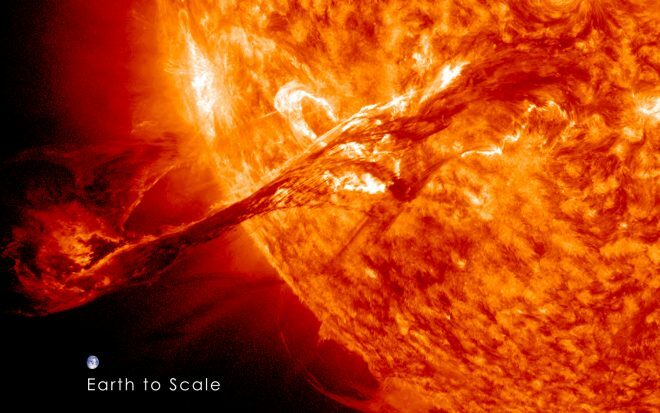 The National Oceanic and Atmospheric Administration classifies solar storms on a scale of one to five (one being the weakest; five being the most severe). For instance, a storm forecast to be a G3 event means it could have the strength to cause fluctuations in some power grids, intermittent radio blackouts in higher latitudes and possible GPS issues. This is what can happen to a planet with a strong magnetic field and a sun that is no longer prone to sending out frequent solar flares. Imagine what stellar storms can do when the star is younger and more prone to powerful flaring, and the planet less protected. Exoplanet scientists often talk of the possibility that a particular planet was “sterilized” by the high-energy storms, and so could never be habitable. But this new research suggests that some stellar storms could have just the opposite effect — making the planet more habitable. As a young scientist, Tony del Genio of NASA’s Goddard Institute for Space Studies in New York City met Clyde Tombaugh, the discoverer of Pluto. That prediction was spectacularly wrong. In 1992, two scientists discovered the first planet around another star, or exoplanet, and since then more people have found planets than throughout all of Earth’s preceding history. As of this month, scientists have confirmed more than 3,500 exoplanets in more than 2,700 star systems. Del Genio has met many of these new planet finders. Del Genio is now co-lead of a NASA interdisciplinary initiative [NEXSS] to search for life on other worlds. This new position as the lead of this project may seem odd to those who know him professionally. Why? He has dedicated decades to studying Earth, not searching for life elsewhere. We know of only one living planet: our own. But we know it very well. As we move to the next stage in the search for alien life, the effort will require the expertise of planetary scientists, heliophysicists and astrophysicists. However, the knowledge and tools NASA has developed to study life on Earth will also be one of the greatest assets to the quest. There are two main questions in the search for life: With so many places to look, how can we focus in on the places most likely to harbor life? What are the unmistakable signs of life — even if it comes in a form we don’t fully understand? Del Genio recognizes that life may well exist in forms and places so bizarre that it might be substantially different from Earth. But in this early phase of the search, “We have to go with the kind of life we know,” he said. Further, we should make sure we use the detailed knowledge of Earth. In particular, we should make sure of our discoveries on life in various environments on Earth, our knowledge of how our planet and its life have affected each other over Earth history, and our satellite observations of Earth’s climate. Above all else, that means liquid water. Every cell we know of — even bacteria around deep-sea vents that exist without sunlight — requires water. Research scientist Morgan Cable of NASA’s Jet Propulsion Laboratory in Pasadena, California, is looking within the solar system for locations that have the potential to support liquid water. Some of the icy moons around Saturn and Jupiter have oceans below the ice crust. These oceans were formed by tidal heating, that is, warming of the ice caused by friction between the surface ice and the core as a result of the gravitational interaction between the planet and the moon. “We thought Enceladus was just boring and cold until the Cassini mission discovered a liquid water subsurface ocean,” said Cable. The water is spraying into space, and the Cassini mission found hints in the chemical composition of the spray that the ocean chemistry is affected by interactions between heated water and rocks at the seafloor. The Galileo and Voyager missions provided evidence that Europa also has a liquid water ocean under an icy crust. Observations revealed a jumbled terrain that could be the result of ice melting and reforming. As missions to these moons are being developed, scientists are using Earth as a testbed. Just as prototypes for NASA’s Mars rovers made their trial runs on Earth’s deserts, researchers are testing both hypotheses and technology on our oceans and extreme environments. For any star, it’s possible to calculate the range of distances where orbiting planets could have liquid water on the surface. This is called the star’s habitable zone. Astronomers have already located some habitable-zone planets, and research scientist Andrew Rushby, of NASA Ames Research Center, in Moffett Field, California, is studying ways to refine the search. Location alone isn’t enough. “An alien would spot three planets in our solar system in the habitable zone [Earth, Mars and Venus],” Rushby said, “but we know that 67 percent of those planets are not very habitable.” He recently developed a simplified model of Earth’s carbon cycle and combined it with other tools to study which planets in the habitable zone would be the best targets to look at for life, considering probable tectonic activity and water cycles. He found that larger rocky planets are more likely than smaller ones to have surface temperatures where liquid water could exist, given the same amount of light from the star. Renyu Hu, of JPL, refined the search for habitable planets in a different way, looking for the signature of a rocky planet. Basic physics tells us that smaller planets must be rocky and larger ones gaseous, but for planets ranging from Earth-sized to about twice that radius, astronomers can’t tell a large rocky planet from a small gaseous planet. Hu pioneered a method to detect surface minerals on bare-rock exoplanets and defined the atmospheric chemical signature of volcanic activity, which wouldn’t occur on a gas planet. When scientists are evaluating a possible habitable planet, “life has to be the hypothesis of last resort,” Cable said. “You must eliminate all other explanations.” Identifying possible false positives for the signal of life is an ongoing area of research in the exoplanet community. For example, the oxygen in Earth’s atmosphere comes from living things, but oxygen can also be produced by inorganic chemical reactions. Shawn Domagal-Goldman, of NASA’s Goddard Space Flight Center in Greenbelt, Maryland, looks for unmistakable, chemical signs of life, or biosignatures. One biosignature may be finding two or more molecules in an atmosphere that shouldn’t be there at the same time. He uses this analogy: If you walked into a college dorm room and found three students and a pizza, you could conclude that the pizza had recently arrived, because college students quickly consume pizza. Oxygen “consumes” methane by breaking it down in various chemical reactions. Without inputs of methane from life on Earth’s surface, our atmosphere would become totally depleted of methane within a few decades. When humans start collecting direct images of exoplanets, even the closest one will appear as a handful of pixels in the detector – something like the famous “blue dot” image of Earth from Saturn. What can we learn about planetary life from a single dot? Stephen Kane of the University of California, Riverside, has come up with a way to answer that question using NASA’s Earth Polychromatic Imaging camera on the National Oceanic and Atmospheric Administration’s Deep Space Climate Observatory (DSCOVR). These high-resolution images — 2,000 x 2,000 pixels – document Earth’s global weather patterns and other climate-related phenomena. “I’m taking these glorious pictures and collapsing them down to a single pixel or handful of pixels,” Kane explained. He runs the light through a noise filter that attempts to simulate the interference expected from an exoplanet mission. DSCOVR takes a picture every half hour, and it’s been in orbit for two years. Its more than 30,000 images are by far the longest continuous record of Earth from space in existence. By observing how the brightness of Earth changes when mostly land is in view compared with mostly water, Kane has been able to reverse-engineer Earth’s rotation rate — something that has yet to be measured directly for exoplanets. When Will We Find Life? Every scientist involved in the search for life is convinced it’s out there. Their opinions differ on when we’ll find it. “Every scientist involved in the search for life is convinced it’s out there.” This is wishful, faith-based speculation motivated by continued funding prospects. The aphorism of human behavior that we are compelled to trivialize what we do not understand applies. A consensus-driven likelihood of life on other planets does not fair well against the lack of understanding of how life began on Earth but more importantly the true scientific revelations of intractable naturalistic inadequacies and failings to properly specify and empirically verify all required conditions and steps in earth’s origin of life. Speculation about science fiction alternatives cannot be taken seriously. Once upon a time, the detection of abundant molecular oxygen in an exoplanet’s atmosphere was considered to be a “slam-dunk” indication of a biosphere. O2 is an exhaust gas from the production of glucose, life’s molecular Clif Bar. The heavy, disequilibrium presence of oxygen in the Earth’s atmosphere only exists because lots of biomass keeps pumping it in. However, as observing capabilities have advanced to the point where we can actually start studying exoplanet atmospheres, the widening theoretical picture has become much more interesting. Would molecular oxygen indicate the presence of life? Well, maybe… and maybe not. It could be generated without life when UV insolation breaks up H2O or CO2 molecules. This is not significant in the Earth’s atmosphere, but today’s paper notes that it could be significant in dry, CO2-dominated atmospheres of planets around M-dwarfs. Detection and verification of biosignatures will be hard, and not only because false positives will try to fool us. The signals are tiny, and will require long integration times with next-generation space telescopes and extremely large telescopes (ELTs). But those telescopes will be heavily oversubscribed, and observation times will have to be kept down to the absolute minimum. Therefore, it is to our benefit to be clever and find complementary and easier ways of inferring the presence of a biosphere. The authors of today’s paper consider chemistry that is “downstream” from the most direct biomarkers. They are interested in molecules with wide rovibrational absorption or emission bands (molecules can twist, turn, and stretch in ways that correspond to a wide range of energies) because observations will forseeably be limited to low-resolution spectroscopy. The authors consider a nitrogen-dominated atmosphere, like present-day Earth’s. Nitrogen is handy for life because it can reassemble itself with hydrogen to help form stringy organic molecules. But before that happens, if an active star showers planets with electrons and UV and X-ray photons (XUV), N2 and H2O molecules will be broken up and reassemble into others containing sulfur or deuterium, which in turn join up with O2 to produce nitric oxide (NO). The study, titled Atmospheric Beacons of Life from Exoplanets Around G and K Stars, recently appeared in Nature Scientific Reports. 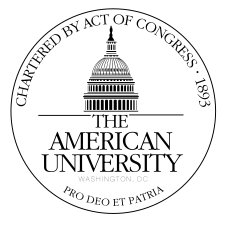 Led by Vladimir S. Airapetian, a senior astrophysicist with the Heliophysics Science Division (HSD) at the NASA Goddard Space Flight Center, the team included members from NASA’s Langley Research Center, the Science Systems and Applications Incorporated (SSAI), and the American University. Stephen Kane spends a lot of time staring at bad pictures of a planet. The images are just a few pixels across and nearly featureless. Yet Kane, an astronomer at the University of California, Riverside, has tracked subtle changes in the pixels over time. They are enough for him and his colleagues to conclude that the planet has oceans, continents, and clouds. That it has seasons. And that it rotates once every 24 hours. He knows his findings are correct because the planet in question is Earth. An image from the Deep Space Climate Observatory satellite (left), degraded to a handful of pixels (right), is a stand-in for how an Earth-like planet around another star might look through a future space telescope. Kane took images from the Deep Space Climate Observatory satellite, which has a camera pointing constantly at Earth from a vantage partway to the sun, and intentionally degraded them from 4 million pixels to just a handful. The images are a glimpse into a future when telescopes will be able to just make out rocky, Earth-sized planets around other stars. Kane says he and his colleagues are trying to figure out “what we can expect to see when we can finally directly image an exoplanet.” Their exercise shows that even a precious few pixels can help scientists make the ultimate diagnosis: Does a planet harbor life? Finding conclusive evidence of life, or biosignatures, on a planet light-years away might seem impossible, given that space agencies have spent billions of dollars sending robot probes to much closer bodies that might be habitable, such as Mars and the moons of Saturn, without detecting even a whiff of life. But astronomers hope that a true Earth twin, bursting with flora and fauna, would reveal its secrets to even a distant observer. Detecting them won’t be easy, considering the meager harvest of photons astronomers are likely to get from such a tiny, distant world, its signal almost swamped by its much brighter nearby star. 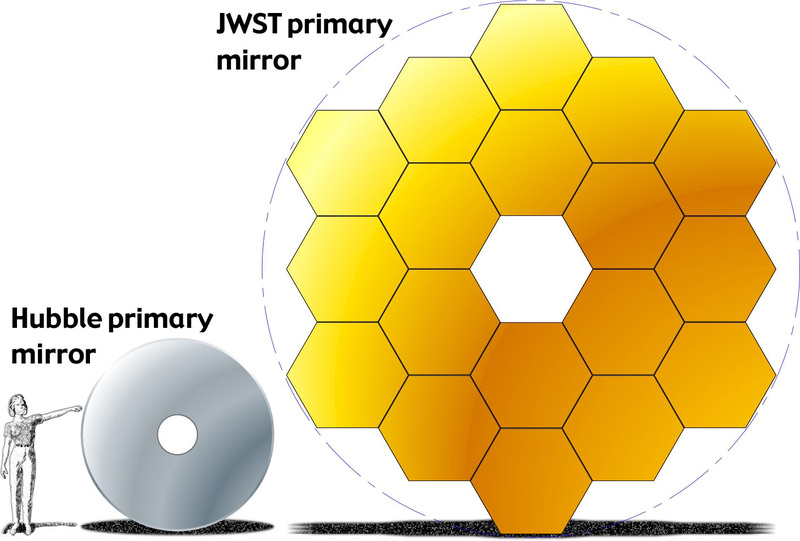 The new generation of space telescopes heading toward the launch pad, including NASA’s mammoth James Webb Space Telescope (JWST), have only an outside chance of probing an Earth twin in sufficient detail. But they will be able to sample light from a range of other planets, and astronomers are already dreaming of a space telescope that might produce an image of an Earth-like planet as good as Kane’s pixelated views of Earth. To prepare for the coming flood of exoplanet data, and help telescope designers know what to look for, researchers are now compiling lists of possible biosignatures, from spectral hints of gases that might emanate from living things to pigments that could reside in alien plants or microbes. There is unlikely to be a single smoking gun. Instead, context and multiple lines of evidence will be key to a detection of alien life. Finding a specific gas—oxygen, say—in an alien atmosphere isn’t enough without figuring out how the gas could have gotten there. Knowing that the planet’s average temperature supports liquid water is a start, but the length of the planet’s day and seasons and its temperature extremes count, too. Even an understanding of the planet’s star is imperative, to know whether it provides steady, nourishing light or unpredictable blasts of harmful radiation. “Each [observation] will provide crucial evidence to piece together to say if there is life,” says Mary Voytek, head of NASA’s astrobiology program in Washington, D.C. Instead, efforts focused on exploring the diversity of exoplanets, using both ground-based telescopes and missions such as NASA’s Kepler spacecraft. Altogether they have identified more than 3500 confirmed exoplanets, including about 30 roughly Earth-sized worlds capable of retaining liquid water. But such surveys give researchers only the most basic physical information about the planets: their orbits, size, and mass. In order to find out what the planets are like, researchers need spectra: light that has passed through the planet’s atmosphere or been reflected from its surface, broken into its component wavelengths. Most telescopes don’t have the resolution to separate a tiny, dim planet from its star, which is at least a billion times brighter. But even if astronomers can’t see a planet directly, they can still get a spectrum if the planet transits, or passes in front of the star, in the course of its orbit. As the planet transits, starlight shines through its atmosphere; gases there absorb particular wavelengths and leave characteristic dips in the star’s spectrum. Astronomers can also study a transiting planet by observing the star’s light as the planet’s orbit carries it behind the star. Before the planet is eclipsed, the spectrum will include both starlight and light reflected from the planet; afterward, the planet’s contribution will disappear. Subtracting the two spectra should reveal traces of the planet. Teasing a recognizable signal from the data is far from easy. Because only a tiny fraction of the star’s light probes the atmosphere, the spectral signal is minuscule, and hard to distinguish from irregularities in the starlight itself and from absorption by Earth’s own atmosphere. Most scientists would be “surprised at how horrible the data is,” says exoplanet researcher Sara Seager of the Massachusetts Institute of Technology in Cambridge. In spite of those hurdles, the Hubble and Spitzer space telescopes, plus a few others, have used these methods to detect atmospheric gases, including sodium, water, carbon monoxide and dioxide, and methane, from a handful of the easiest targets. Most are “hot Jupiters”—big planets in close-in orbits, their atmospheres puffed up by the heat of their star. In an artist’s concept, a petaled starshade flying at a distance of tens of thousands of kilometers from a space telescope blocks a star’s light, opening a clear view of its planets. NASA/JPL. The approach will pay much greater dividends after the launch of the JWST in 2019. Its 6.5-meter mirror will collect far more light from candidate stars than existing telescopes can, allowing it to tease out fainter exoplanet signatures, and its spectrographs will produce much better data. And it will be sensitive to the infrared wavelengths where the absorption lines of molecules such as water, methane, and carbon monoxide and dioxide are most prominent. Once astronomers have such spectra, one of the main gases that they hope to find is oxygen. Not only does it have strong and distinctive absorption lines, but many believe its presence is the strongest sign that life exists on a planet. Oxygen-producing photosynthesis made Earth what it is today. First cyanobacteria in the oceans and then other microbes and plants have pumped out oxygen for billions of years, so that it now makes up 21% of the atmosphere—an abundance that would be easily detectable from afar. Photosynthesis is evolution’s “killer app,” says Victoria Meadows, head of the NASA-sponsored Virtual Planet Laboratory (VPL) at the University of Washington in Seattle. It uses a prolific source of energy, sunlight, to transform two molecules thought to be common on most terrestrial planets—water and carbon dioxide—into sugary fuel for multicellular life. Meadows reckons it is a safe bet that something similar has evolved elsewhere. “Oxygen is still the first thing to go after,” she says. Fifteen years ago, when exoplanets were new and researchers started thinking about how to scan them for life, “Champagne would have flowed” if oxygen had been detected, Meadows recalls. But since then, researchers have realized that things are not that simple: Lifeless planets can have atmospheres full of oxygen, and life can proliferate without ever producing the gas. That was the case on Earth, where, for 2 billion years, microbes practiced a form of photosynthesis that did not produce oxygen or many other gases. “We’ve had to make ourselves more aware of how we could be fooled,” Meadows says. To learn what a genuine biosignature might look like, and what might be a false alarm, Meadows and her colleagues at the VPL explore computer models of exoplanet atmospheres, based on data from exoplanets as well as observations of more familiar planets, including Earth. They also do physical experiments in vacuum chambers. They recreate the gaseous cocktails that may surround exoplanets, illuminate them with simulated starlight of various kinds, and see what can be measured. Over the past few years, VPL researchers have used such models to identify nonbiological processes that could make oxygen and produce a “false positive” signal. For example, a planet with abundant surface water might form around a star that, in its early years, surges in brightness, perhaps heating the young planet enough to boil off its oceans. Intense ultraviolet light from the star would bombard the resulting water vapor, perhaps splitting it into hydrogen and oxygen. The lighter hydrogen could escape into space, leaving an atmosphere rich in oxygen around a planet devoid of life. “Know thy star, know thy planet,” recites Siddharth Hegde of Cornell University’s Carl Sagan Institute. Discovering methane in the same place as oxygen, however, would strengthen the case for life. Although geological processes can produce methane, without any need for life, most methane on Earth comes from microbes that live in landfill sites and in the guts of ruminants. Methane and oxygen together make a redox pair: two molecules that will readily react by exchanging electrons. If they both existed in the same atmosphere, they would quickly combine to produce carbon dioxide and water. But if they persist at levels high enough to be detectable, something must be replenishing them. “It’s largely accepted that if you have redox molecules in large abundance they must be produced by life,” Hegde says. Some argue that by focusing on oxygen and methane—typical of life on Earth—researchers are ignoring other possibilities. If there is one thing astronomers have learned about exoplanets so far, it is that familiar planets are a poor guide to exoplanets’ huge diversity of size and nature. And studies of extremophiles, microbes that thrive in inhospitable environments on Earth, suggest life can spring up in unlikely places. Exobiology may be entirely unlike its counterpart on Earth, and so its gaseous byproducts might be radically different, too. But what gases to look for? Seager and her colleagues compiled a list of 14,000 compounds that might exist as a gas at “habitable” temperatures, between the freezing and boiling points of water; to keep the list manageable they restricted it to small molecules, with no more than six nonhydrogen atoms. About 2500 are made of the biogenic atoms carbon, nitrogen, oxygen, phosphorus, sulfur, and hydrogen, and about 600 are actually produced by life on Earth. Detecting high levels of any of these gases, if they can’t be explained by nonbiological processes, could be a sign of alien biology, Seager and her colleagues argue. Light shining through the atmospheres of transiting exoplanets is likely to be the mainstay of biosignature searches for years to come. But the technique tends to sample the thin upper reaches of a planet’s atmosphere; far less starlight may penetrate the thick gases that hug the surface, where most biological activity is likely to occur. 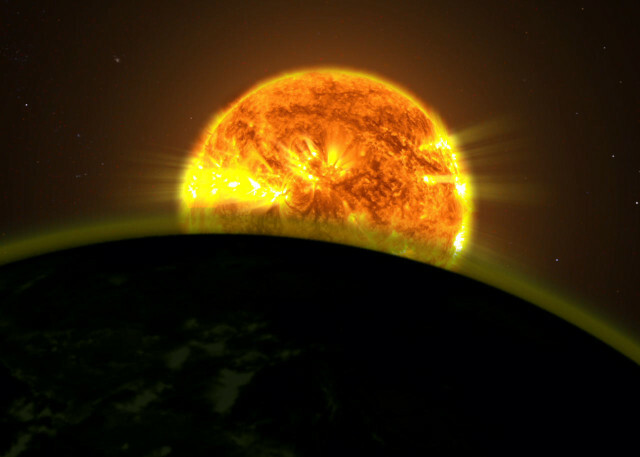 The transit technique also works best for hot Jupiters, which by nature are less likely to host life than small rocky planets with thinner atmospheres. The JWST may be able to tease out atmospheric spectra from small planets if they orbit small, dim stars like red dwarfs, which won’t swamp the planet’s spectrum. But these red dwarfs have a habit of spewing out flares that would make it hard for life to establish itself on a nearby planet. To look for signs of life on a terrestrial planet around a sunlike star, astronomers will probably have to capture its light directly, to form a spectrum or even an actual image. That requires blocking the overwhelming glare of the star. Ground-based telescopes equipped with “coronagraphs,” which precisely mask a star so nearby objects can be seen, can now capture only the biggest exoplanets in the widest orbits. To see terrestrial planets will require a similarly equipped telescope in space, above the distorting effect of the atmosphere. NASA’s Wide Field Infrared Survey Telescope (WFIRST), expected to launch in the mid-2020s, is meant to fill that need. Even better, WFIRST could be used in concert with a “starshade”—a separate spacecraft stationed 50,000 kilometers from the telescope that unfurls a circular mask tens of meters across to block out starlight. A starshade is more effective than a coronagraph at limiting the amount of light going into the telescope. It not only blocks the star directly, but also suppresses diffraction with an elaborate petaled edge. That reduces the stray scattered light that can make it hard to spot faint planets. A starshade is a much more expensive prospect than a coronagraph, however, and aligning telescope and starshade over huge distances will be a challenge. Direct imaging will provide much better spectra than transit observations because light will pass through the full depth of the planet’s atmosphere twice, rather than skimming through its outer edges. But it also opens up the possibility of detecting life directly, instead of through its waste gases in the atmosphere. If organisms, whether they are plants, algae, or other microbes, cover a large proportion of a planet’s surface, their pigments may leave a spectral imprint in the reflected light. Earthlight contains an obvious imprint of this sort. Known as the “red edge,” it is the dramatic change in the reflectance of green plants at a wavelength of about 720 nanometers. Below that wavelength, plants absorb as much light as possible for photosynthesis, reflecting only a few percent. At longer wavelengths, the reflectance jumps to almost 50%, and the brightness of the spectrum rises abruptly, like a cliff. “An alien observer could easily tell if there is life on Earth,” Hegde says. There’s no reason to assume that alien life will take the form of green plants. So Hegde and his colleagues are compiling a database of reflectance spectra for different types of microbes. Among the hundreds the team has logged are many extremophiles, which fill marginal niches on Earth but may be a dominant life form on an exoplanet. Many of the microbes on the list have not had their reflectance spectra measured, so the Cornell team is filling in those gaps. Detecting pigments on an exoplanet surface would be extremely challenging. But a tell-tale color in the faint light of a distant world could join other clues—spectral absorption lines from atmospheric gases, for example—to form “a jigsaw puzzle which overall gives us a picture of the planet,” Hegde says. None of the telescopes available now or in the next decade is designed specifically to directly image exoplanets, so biosignature searches must compete with other branches of astronomy for scarce observing time. What researchers really hanker after is a large space telescope purpose-built to image Earth-like alien worlds—a new incarnation of the idea behind NASA’s ill-fated Terrestrial Planet Finder. The Habitable Exoplanet Imaging Mission, or HabEx, a mission concept now being studied by NASA, could be the answer. Its telescope would have a mirror up to 6.5 meters across—as big as the JWST’s—but would be armed with instruments sensitive to a broader wavelength range, from the ultraviolet to the near-infrared, to capture the widest range of spectral biosignatures. The telescope would be designed to reduce scattered light and have a coronagraph and starshade to allow direct imaging of Earth-sized exoplanets.